Max Carney from the Crypto Wealth SCAM does sound very convincing, but in reality he is an unknown actor, as we uncover in this review. Let’s get straight to the facts concerning Crypto-Wealth.co aka CryptoWealthCreator.co, starting with the obvious lies and deception. Based on Whois.com it appears that this website was registered on September 22nd, 2017. In the video presentation, he displays an alleged transfer from September 2nd, 2017 by Crypto Wealth LLC, therefore two things do not really match up. First, banks do not operate on Saturdays anywhere in the world, and the software didn’t really exist back then. One could assume that the they may have operated without the website, however there’s really no such LLC registered anywhere in the world. This fact alone leads us to a definite conclusion that the bank statement presented by the alleged Max Carney is totally bogus. At the time we looked up Crypto Wealth Creator Software on YouTube, the main video had a little bit over 123 views and the 2nd pitch page video had a total of 17! The channel’s name is “yt3 yt3” and with a total of 121 subscribers, yet there’s only 1 video posted on the shady channel. Just like anything else we noticed, nothing really makes any sense. Obviously, the very few subs are fake as well, most likely purchased on Fiverr.com. Just as we noted right at the beginning of our Crypto Wealth review, obviously, the scammers behind this are trying to trick potential members by using two domains pointing to the same place. Try accessing CryptoWealthCreator.co and Crypto-Wealth.co. The sites share the same content, shady actor and awful lies. Are they expecting one of the domains to get flagged? Perhaps they are looking to target people from two angles.This is certainly not a common business practice among trustworthy firms. We’ve seen services do it, but for SEO purposes, and in those cases, they use different content for each site. It’s a very typical bait and switch, since Max does offer some common sense facts at the beginning of the presentation, but he gradually stops making sense. Crypto Currencies are a great opportunity, but not when traded with an overnight fraud software. Even the YouTube videos on the pitch page are a relatively new yet they already seem to have plenty of “positive testimonials…” We decided to look up a few of the pictures on Google and we found that those are stock photos and not authentic members. Kim Sores, Thomas Rollin, Stefani Rosa and the rest of the Crypto-Wealth.co members are all fake. 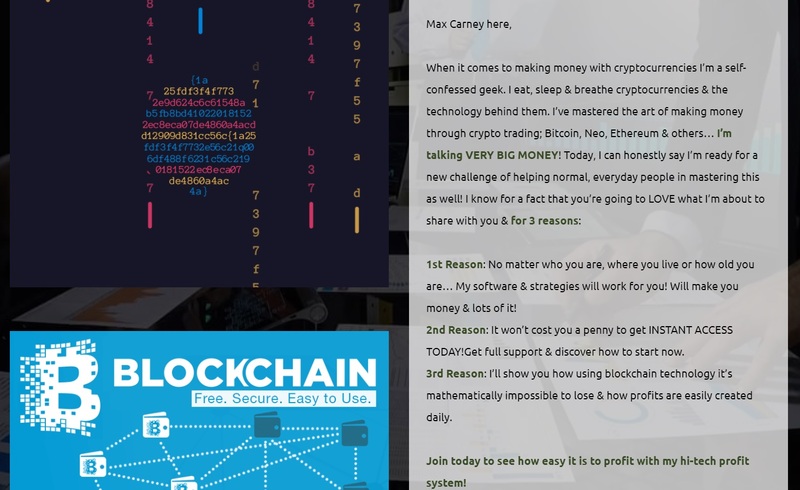 Perhaps Max Carney is a real investor and software developer with a very sketchy webmaster? Unfortunately not! After all he did claim some recognition by the world’s top financial magazines such as Forbes, Bloomberg and Financial Times. Not to our surprise, this guy is not even featured on LinkedIn or Facebook. He clearly doesn’t exist, at least not the “Max Carney” from Crypto Wealth LLC. It would’ve been trickier to expose the fraud if we could find anything real besides the risk disclaimers, which are obviously there for legal protection. Seems like they’re covered in case you fall into this trap and deposit money! If you still feel inclined to move forward with this “opportunity,” it would be a reckless mistake and we strongly recommend that you think twice. You might as well donate a few extra dollars to charity, you will never see this money again. Review Verdict: Crypto Wealth Creator is a SCAM! Feel free to share any feedback regarding Crypto Wealth Creator by commenting below this review. BitClub Network is a SCAM! Feel free to read our mining guide. At the moment, the best site would be NichHash. Hi there,did you hear of the Crypto advantage software! I could not find it in your blog. What is your take on it!